Owasco Lake is the sixth largest of the Finger Lakes. It is located on the south edge of the City of Auburn and contained entirely within Cayuga County. Compared to the other Finger Lakes, Owasco Lake is an intermediate-sized lake. It has a large drainage basin to surface ratio (the larger the basin, the larger the surface inflow, including nutrients), which may account for the high nutrient-loading of Owasco Lake. Owasco Lake provides drinking water to over 44,000 residents in Cayuga County, including residents within the City of Auburn. 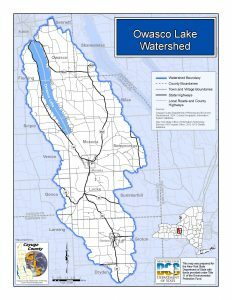 Click here to view the Owasco Lake Watershed map. Towns within the watershed: Towns of Fleming, Genoa, Locke, Moravia, Niles, Owasco, Scipio, Sempronius, Sennett, Summerhill and Venice in Cayuga County. Towns of Dryden, Groton and Lansing in Tompkins County. Skaneateles in Onondaga County. Villages within the watershed: Village of Moravia in Cayuga County and Village of Groton in Tompkins County. 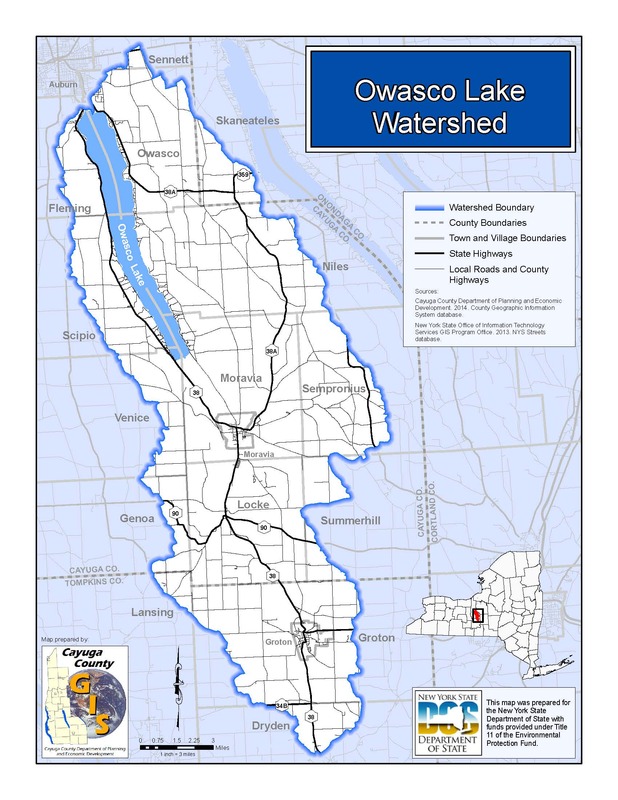 Owasco Lake Watershed Management and Waterfront Revitalization Plan and the Owasco Lake Watershed Management Plan: Watershed and Waterbody Inventory Report. These documents examine the present (2016) state of Owasco Lake and its watershed, how water quality and habitat conditions are changing, and the challenges of meeting community goals for continued use and enjoyment of this valued resource. The County has also received a grant to incorporate the Environmental Protection Agency’s (EPA) Nine Key Elements (separate webpage on Planning site, not created yet) into the Owasco Lake Watershed Management and Waterfront Revitalization Plan.